If you thought that the Swiss are as square as their flag, think again. Because for any strict society, there is always a loophole. Historical records show that two centuries ago, the strictly protestant Zürich residents were prohibited to have a drink, eat sweets or show off their skin in public. But the long arm of the Reformation did not extend all the way to Baden, a town downriver from Zürich. The people's regular escape from Zürich to frivolous Baden was called Badenfahrt. We decided to find out what all the fuss is about, so we signed up for a private city tour of Baden. Our tour guide on this chilly spring morning explains that during Medieval times, the town had a special appeal due to the many hot springs and ancient Roman baths. And if this were not enough, Baden's bakers were (and still are) hawking an exclusive pastry that all the Zürchers craved to try: The Spanisch Brötli. As we are crisscrossing the very place where all this frivolous activity once took place, our tour guide has our attention. And what amazes us most is the fact that the Badenfahrt escape was used by men of all walks of life, including wealthy rulers and even church dignitaries. "From the poor to the Pope," he confirms. A short distance from Turicum to Aquae Helveticae. In modern times, the distance from Zürich to Baden has shrunk to all but 15 minutes on the train. The history does not stop there, because we are riding on Switzerland's first ever railroad connection. 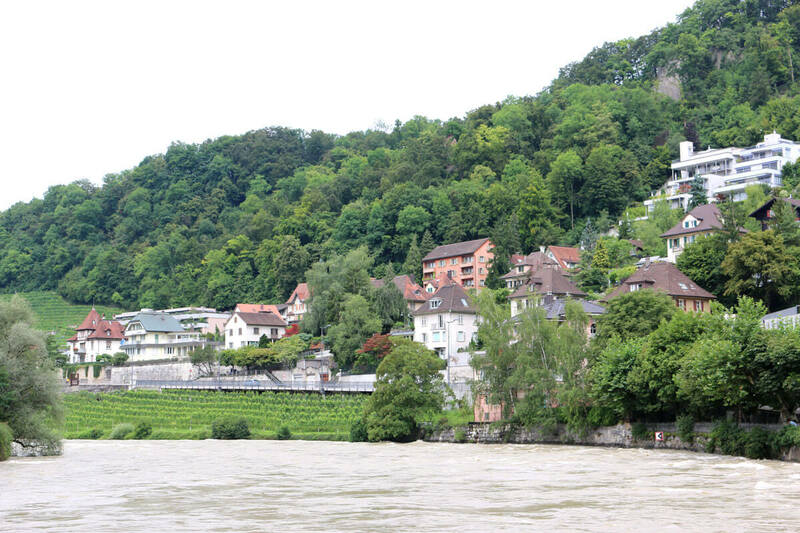 In a whisk, we arrive in Baden and make our way through the historic old town to the thermal spa neighborhood. The houses in this part of Baden are well kept, hiding lots of interesting details. For instance, it pays to look up because many of the facades have stories painted on them. 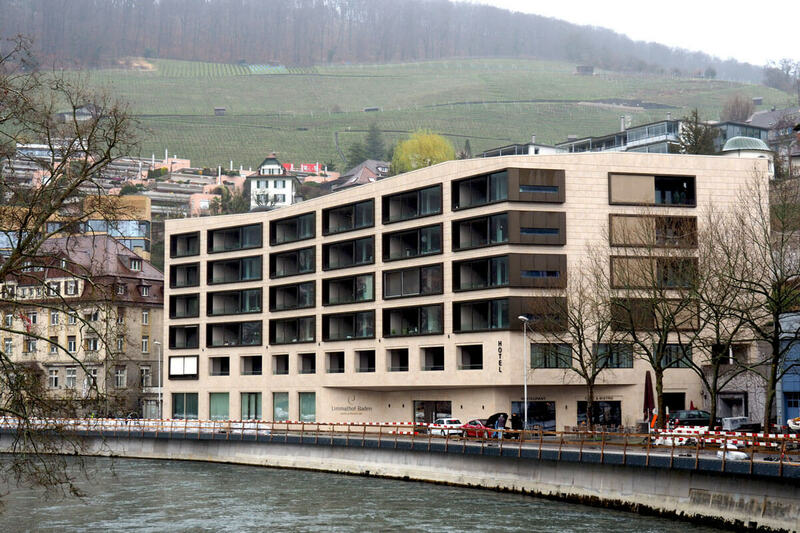 On the town side of the River Limmat, the once flourishing area with hot spring baths has come to a temporary halt. It was the Romans who first sensed the springs all around Aquae Helveticae, using their architectural skills to build elaborate public baths. (The water is said to cure rheumatics and ailments.) But the thermal spa industry took a toll during the two world wars. We are checking in at the Limmathof Hotel and Spa. Today, only three hotels remain: The historic Limmathof Baden Hotel where we have lodged before, the Atrium Hotel Blume and the modern Limmathof Baden Hotel & Private Spa across the river. (This is where the Limmat makes a steep, ninety degree curve.) The Limmathof has exclusive access to one of Baden's 18 natural springs, spewing the hottest water in all of Switzerland. We love spending lazy Sundays at the in-house spa, which is open to the public. But this time, we are curious about the new addition of the hotel with its private spas. A green footbridge connects Baden with Ennetbaden where our hotel is located. There are fewer hot springs on that side of the river, but the hotel has access to one and can barely keep up with all that hot water. We will decide against booking one of the secluded private spa, but the hotel director, Mr. Diebold, lets us have a peek. He explains that the water naturally squirts out at 47 degrees Celsius. By storing the water in a large tank, it is cooled off until the temperature reaches a comfortable 35 degrees Celsius. The private spas are fairly large, windowless rooms with their own whirlpool tub. We could imagine renting one for a couple's getaway or a wedding anniversary. Atrium Hotel Blume might be Baden's most charming restaurant. For a classy dinner in Baden, we know just the place to go. The Atrium Hotel Blume with its unique restaurant is located a stone's throw from the hotel. Inside, there is a prominent courtyard which defines the architecture of this historic building. Each floor is lined with balconies featuring Art Deco railings, with the restaurant being on the first floor. On our tour, we learned that this charming Schindler elevator is the oldest one still in operation - riding it is quite an experience. The public spa and the breakfast buffet at the Limmathof, the unique Restaurant Blume and even a visit to Museum Langmatt are enough reasons to spend a weekend in Baden. And to get the most out of your visit, hire an English speaking tour guide. They even have a tour about Baden's history with "murderers, witches, whores and arsonists." Experience the modern equivalent of Badenfahrt from Aug 18 to 27, 2017! It is one of Switzerland's largest festivals and it only takes place every ten years. More information about the event here.